NEW YORK (AP) For rookies Miguel Andujar and Gleyber Torres and most everyone else swinging a bat for the New York Yankees, this was an extra special evening. Slumping Giancarlo Stanton homered in going 4 for 4 and Didi Gregorius hit a grand slam as the Yankees posted their first three-game winning streak under new manager Aaron Boone. 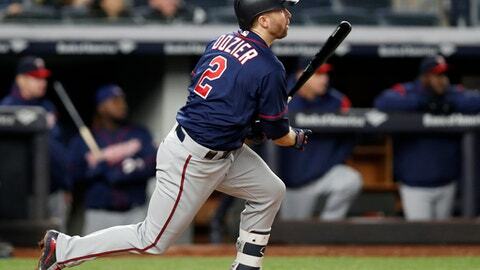 Brian Dozier singled home Minnesota’s run. He has a team-record 17-game hitting streak to begin a season, and a 24-game string dating to last year. Masahiro Tanaka (3-2) gave up three hits in 6 2/3 innings and left with a 5-1 lead after not allowing a home run for the first time in five starts this year. He’s won all five of his career outings against the Twins. Jake Odorizzi (1-2) was pulled after Stanton’s solo homer in the fifth. After the game, the Yankees announced they had acquired RHP A.J. Cole from Washington for cash. The 26-year-old Cole was 1-1 with a 13.06 ERA in four games for the Nationals and was designated for assignment last week. RHP David Hale was designated for assignment. He pitched two scoreless innings to finish Monday night’s rout. LaMarre trotted from center field to the mound with one out and one on in the eighth. Throwing pitches in the low 70s mph, he got Aaron Hicks to pop out, then gave up Austin’s homer. LaMarre retired Andujar on a grounder to end the inning. LaMarre pitched once before in the majors, throwing a scoreless inning for Boston in 2016. ”You hate to be in that situation, just from a win-loss standpoint, because it’s usually not good. But just try to get out of there and save a couple of arms hopefully for tomorrow,” he said. ”I’m literally here to do whatever the team needs. If it’s a matter of eating a few innings or just getting on the mound, I don’t really care,” he said. Twins: OF Byron Buxton (migraines) was scratched from a Class A rehab game after fouling a ball off his foot. The Twins had hoped he could rejoin them Wednesday night in New York. He’s now more likely be back this weekend when Minnesota hosts Cincinnati. Yankees: INF Brandon Drury is set to play a rehab game Wednesday at Triple-A. He’s been out because of migraines that have caused blurry vision. An aggravated tendon in the back of his neck has caused the trouble, and he’s getting acupuncture and other treatment. Twins: RHP Jose Berrios (2-1, 1.63 ERA) starts Tuesday night. He took the loss last year in the AL wild-card game, allowing three runs and five hits over three innings in relief. Yankees: LHP CC Sabathia (0-0, 2.70) makes his fourth start this season. He is 19-9 with a 3.16 ERA in 38 career starts against the Twins.